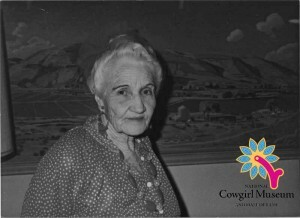 Born into a pioneer ranching family, Bebe spent most of her life tending to ranch matters. Though she was an equal partner with her husband, she operated the ranch alone much of the time. Her efforts set new standards in sheep ranching. Because she always wanted to be a musician and an artist, Bebe taught herself to play piano and wrote dozens of published and recorded songs. She also taught herself oil painting techniques.